I was just taking a break with a cup of coffee, after a rather long conversation with an acquaintance who mentioned something about Shakespeare's Hamlet - a play which takes place in Denmark (a Scandinavian state in Northern Europe), and this reminded me of the mail I received from a Reader who lives there. He told me in his mail that the Danish Prime Minister has the psychopathic stare. I didn't check it out when I wrote the Psychopathic Stare articles, but the Hamlet discussion inspired me to take a look. I didn't expect to find anything I would be able to notice as psychopathic or otherwise odd, since I generally can't see the 'cold' or 'unemotional' quality that people so often talk about, and even have said to see in me. So I was rather surprised at what I found when I downloaded the attachments in my Danish Reader's mail. The Reader further tells me that in his country the Psychopathy Diagnosis is not called psychopathy, but 'Character Deviant'. A label that leaves most of those who get the diagnosis unaware that they've been diagnosed as psychopaths. But then, according to the Reader this is all in a day's work where he comes from. There the population is pretty much kept in the dark about everything. It reminded me of where I grew up, but I guess this have to be the more extreme. They have the world's highest tax at 50% average, plus 25% VAT on everything from groceries to dentistry and railway tickets. After that comes the extra special charges which differ in between wares and services. Maybe it all adds up in the end, they also have one of the world's highest annual suicide rates. Denmark has fostered some of the world's greatest authors. Hans Christian Andersen who wrote 'The Ugly Duckling' - a story about how the great are bullied by the common and mediocre... a theme that apparently is very central in daily life in those parts even today... comes to mind. 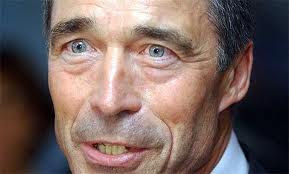 Correction: Anders Fogh Rasmussen is no longer Prime Minister of Denmark, but sits in the European Parliament. Addition: It was brought to my attention that it can seem as if I am saying this man is a psychopath, or that he has a psychopathic stare (which is more or less the same thing). Let me take this opportunity to once again emphasize that I can not determine whether or not someone is a psychopath, or if they have a truly psychopathic stare, from looking at a picture! Nor will I ever attempt to do so! Thoese eyes look in pain, not sociopathic. Oh, I see. Maybe I'm mistaken, maybe the pictures I've viewed were shot accidentally while he stared, but there're plenty of photos from over a decade. Let me take the opportunity to emphasize that I am not saying this man is or is not a psychopath, a sociopath, or representative for any other minority of people!! - I better add that to the article itself. Thank you for your input, and for reminding me that it's important to make sure to not be misunderstood about these things! Zhawq - What specifically do you do to mask you psychopathic stare? I'm not sure what Zhawq does, but I'm very aware of when I'm doing it nowadays. There are subtle ways to shift it from intense and sinister into something that might actually seem endearing, soft or kind. It doesn't take much strain on the facial muscles to depress the eyelids and raise the cheek muscles into something far more innocuous. For me though, I don't always want to mask mine. I like mine. But when I'm with people that I do not want to feel uncomfortable in my presence, I shift. Most people, when they see my stare, simply think I'm being rather intense, or thoughtful, or piercing, not necessarily aggressive, so if someone does see it that I don't want them to, it's very easy to make an excuse that fits a perceived image. People don't want to think you're a monster (usually) so it doesn't take much effort to work with. TNP - Thanks for the insight! I wasn't sure if it was all physical or if there was also a component of adjusting the thoughts you're projecting. I agree with you to on people not wanting to believe someone is a monster. This way they can avoid having to confront a reality outside the one they've been living in. What specifically do you do to mask you psychopathic stare? To avoid the stare (the one that isn't a technique) I first of all became aware of how my poise and look "felt" in the situations where I tend to have it. I then practiced in front of a mirror until I got a more 'relaxed' look. It's something about relaxing your eye-muscles, and the muscles in your facial area around the eyes. When you find yourself 'maybe' having such a stare (because it's not always completely obvious, you can be in doubt), look away and divert attention with some gesticulations, what you say and how you say it. "I'm tired", "I just got a slight head ache all of a sudden", "I closed my eyes? Oh, I didn't notice. I don't know why! ", "I just got thinking... about what you said before...", etc. etc..
yes, that is pretty much how it is with me also. But for obvious reasons I tend to meet a lot of people who don't know me and who I want to relax. It's very much about avoiding all signs that you're not like everybody else. Silly, since everybody have little bits about them that are different from most others, but it can be those very things that decide whether or not you're successful with a person. It is sometimes being remarked upon how psychopaths are too perfect when you first meet us. We know that, but we do it because it's important for the reasons I've stated above. it is very much both physical and psychological. The psychological part comes in where you tend to get this look more in some situations than others, and when you learn how to detect in which situations you're more likely to do it, as well as the 'feel' I talk about. "But for obvious reasons I tend to meet a lot of people who don't know me and who I want to relax." Which is why I am extremely cautious around perpetually pleasant people. "perpetually pleasant" means something is rotten in Denmark. It just doesn't exist unless one is overcompensating. -Lying. If the things you quote about Denmark are true and that is a good photo, I got no doubt about it either. Good work zhawq, well written series. You got a few frustrations at the moment but your writing is improving in my opinion at leaps and bounds and as it does it is ringing home with frightening familiarity.